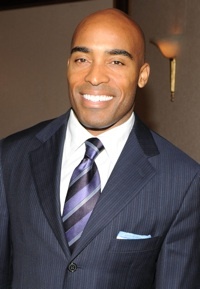 Tiki Barber says he didn’t cheat on his pregnant wife and painting him as the bad guy is unfair. The Today correspondent announced his split from wife Ginny earlier this year. Ginny was eight months pregnant at the time — with twins. Word immediately spread that the reason behind the separation was one Miss Traci Lynn Johnson, Barber’s assistant and a former NBC intern. In fact, we hear that Ginny kicked Tiki out of the house when she found out about the fling! But Tiki Barber is sticking by the man-caught-cheating rule: Deny, deny, deny. Mmm hmm. Traci accompanied Tiki Barber to the Olympics, to Africa and sat next to him at a Travel Channel documentary screening, looking much like a date — all months before the couple’s separation. Is not cheating on your pregnant wife who is already mother to your two other sons really that hard of a standard to live up to?